Makurdi—The lingering rift between Governor Samuel Ortom and his estranged political leader and predecessor, Senator George Akume, yesterday, got to a head as the governor has cautioned the senator to stop playing god. Ortom also accused the former governor of conspiring with enemies of the state to impeach him to destabilise Benue State, assuring that political disaster awaited the senator in the coming 2019 elections if he did not make amends with the majority of Benue people. 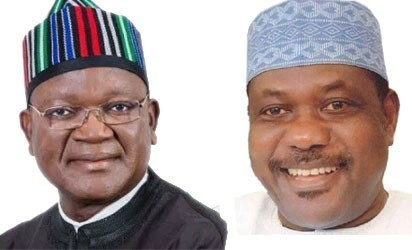 Ortom, who spoke, yesterday, through his Chief Press Secretary, CPS, Terver Akase, was reacting to comments credited to Akume, who at the All Progressives Congress, APC, caucus meeting, weekend, in Makurdi, allegedly demeaned the person of the governor, accusing him of misappropriating funds and vowed to remove him from office in six months. “If not, why should he say he would remove the governor, under which laws was he speaking, under which statutes of this country was he saying that, because he doesn’t have the powers to remove a sitting governor? “He tried it with eight members of the state Assembly and he failed. It was an illegality that has remained an illegality and all of us were here to see that he supervised that illegality that failed. “As much as they failed in the first attempt, they will fail 1,000 times if they try it again because Governor Ortom was popularly elected by Benue people and only the people have the powers to remove him not a senator, not an individual. Reacting to the allegations raised by Governor Ortom against Senator Akume, Director of Publicity of APC in Benue State, Apeh Peterhut, who spoke on behalf of the senator debunked the allegation that Akume was conniving with enemies of the state to impeach the governor or destabilise the state. Peterhut said: “The allegation is baseless and unfounded. I can assure you that we are already mobilising Benue people to ensure the defeat of Governor Ortom in 2019 to liberate the state from the PDP. That was what Senator Akume assured Benue people at the weekend. “So, we are not embarking on any illegal means but through the ballot to have him removed from office.